Do you have a regular family Bible reading time? I don't mean Sundays when everyone heads off to their separate church classes, or throughout the week as you each read the Bible on your own... but an actual time set aside to read and discuss the Bible together? With our often busy schedules, it can be hard to find the time even to grab a meal together, let along opening up our Bibles and having a good discussion on what we read. Still, there are so many benefits to doing so. It allows us to grow closer to each other and God. It gives us something positive to focus on. It allows us as parents to see what our children are learning and to better answer any questions they might have. It helps us lay a better foundation of Christian living that they can lean on as they grow older. Sounds pretty great, right? Yet still... so many of us struggle. Maybe it's the time, maybe it's that we don't feel as though we are the best teachers, maybe our kids are just a little stubborn... or maybe we just don't even know where to begin! Today, I'm sharing some tips to get us started. Set A Time. Find a time that best fits your busy schedules and add it to the calendar. If you can do it every day, that's awesome. If only a few times a week, or even once a week will work out, go with that! Do what works for you! By keeping it on your schedule, it's less likely to fall to the side...and for those kids who like structure, it can help them better prepare for it. Having a hard time finding the time--- consider dinner time! You're already sitting around the table anyway, so make the best use of that together time! Keep It Short. Kids often have a short attention span, so it doesn't need to drag on and on. Stick with a chapter or even just a few verses, especially as you're getting started. Talk About It. Don't just read the Bible, but discuss it too. Ask questions, see if anything stuck out, encourage kids to ask questions. Not only will that help give them the opportunity to truly understand, but you might find you learn something from their perspective too. Keep It Fun. My kids do not like being lectured to. And honestly, who does? Keep it fun with crafts, experiments and activities that are age appropriate. You can even find fun videos to help bring what you're reading to life. When you make it fun, they won't dread the time, but instead come to look forward to it. Pray About It. Pray before and/or after your reading time that your children (and you) will take what they need from these Bible lessons. And if your home is as chaotic as mine often is--- pray that you can have a peaceful moment together too! After teaching a parable Jesus often said, "Whoever has ears, let him hear." In other words, "This is important, so you better listen up" and what could be more important than the good news of the kingdom of God? 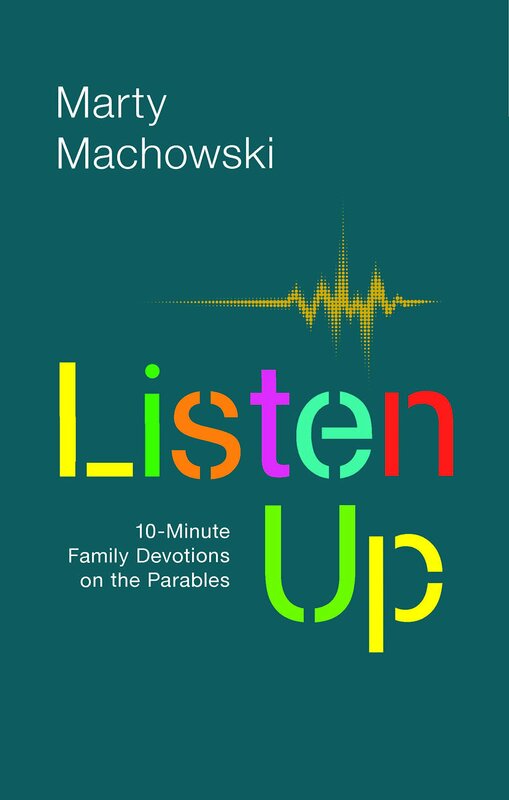 This family devotional provides a unique opportunity for parents to help their children "listen up" and hear the gospel as Jesus himself shared it. Jesus told simple stories using everyday activities and objects that point to surprising spiritual truths about life in his kingdom. In the parables children (and adults!) will learn to treasure the gospel. Children love stories and the parables provide a wonderful opportunity to engage their imaginations and help them understand and live out the good news of the kingdom of God. This thirteen-week family devotional is designed to help families explore the parables that Jesus taught through reading selected parables, activities, discussion questions, and "fun facts." Each five-day session includes Bible reading, discussion questions, a fun activity, and songs. Like so many, I too have struggled to know where to begin with reading the Bible with my children. Did I start at the beginning? Stick with the beloved stories that they hear again and again in Sunday school? What questions do I ask? What exactly should they be taking away from it? This book truly has been a great starting point! Now, I must admit we are still working our way through it, but I love what I'm reading so far. It's broken into 13 weeks, with 5 days or reading each week. While the layout really serves this particular schedule very well, I'm sure you could adjust it a bit to fit your schedule if necessary... and if you miss a day, you can always pick it again. Each week features an action word that the readings are based upon. You are given an intro to help you prepare for what is ahead. There is also a hand on activity that you can do sometime throughout the week, really bringing the lessons to life and making it more fun for kids. Each day then gives a short Bible reading--- you can read it right from the book so you're not jumping back and forth which is definitely a plus. There is then a short devotion to read aloud and think about, followed by questions to ask and discuss. One thing I love about these questions is that the correct answers (where applicable) are given right in the book and again can help give even US a better perspective on what we're reading. If you're new to the Bible or even if you're just not super comfortable in getting it 'right' this is a huge plus. Each day then ends with a prayer... these are not actually written out, but rather a prompt given on what to pray for. I love this as I feel that prayers should be personal, so while it gives us the guideline, it also encourages us to speak to God in our own words, which is what I strive to teach my children to do. Throughout the week there are also some fun facts mixed in and some 'Going Deeper' sections that allow us to go more into the lesson. Some of these might be a little more difficult for younger kids, but is a great way to personalize it for older kids/teens and even yourself so that everyone is getting a great experience from the readings. This book truly is a must see for any parent who wants to incorporate family Bible reading into their schedules. It has thought of everything and truly makes it a stress free and educational experience for kids and parents alike. It is available to purchase now. This sounds like a great, useful book! I love your tips, expecially talking about it and keeping it short.